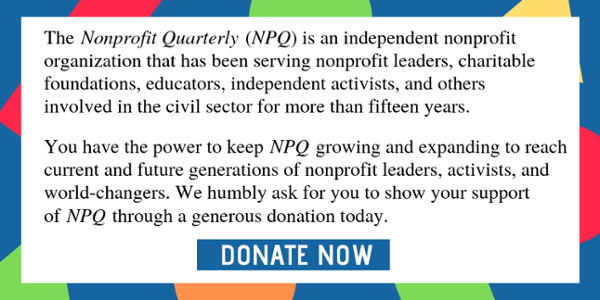 NPQ has written before about the Trump Foundation and its bizarre approach to charity, from the fact that most of its donations were never from Donald Trump to the distributions from the private foundation to various veterans charities during the 2016 campaign (many of which were in fact donated by others on Trump’s behalf). In large part due to Pulitzer Prize-winning David Fahrenthold’s reporting for the Washington Post, the New York Attorney General’s Charities Bureau began an investigation of the Trump Foundation and its dealings. Shortly after the 2016 election, Trump sought to dissolve the foundation, though the NY AG prevented him from doing so while an investigation was underway. The investigators found that Trump used the foundation in self-dealing transactions, such as settling legal disputes and purchasing a signed football helmet (not yet found) and two portraits of himself at a fundraising auction. (One portrait was displayed in a bar at one of his country clubs until its existence was reported in the media.) The foundation allegedly also made a political contribution to Florida AG Pam Bondi’s campaign at Trump’s direction. The only doubt about this allegation is the foundation’s defense that it didn’t know which organization it was supporting and meant to give the money to a similarly named group, which exemplifies the haphazard way in which the foundation’s work was performed. The self-dealing by the foundation was admitted in its 2015 Form 990-PF, made public shortly after the November 2016 presidential general election. The Trump Foundation’s history is a classic example of how not to do charity. A private foundation with family members as board members, the Trump Foundation kept almost no records, conducted no meetings since 1999, and had its affairs handled by Trump business employees with little or no knowledge or experience in the nonprofit sector. The person reported to be the foundation’s treasurer, Alan Weisselberg, wasn’t aware he was listed as foundation treasurer. Though controlled by a man with a self-reported net worth of billions of dollars, the Trump Foundation never had more than a couple of million dollars in assets—almost none of which came from Donald Trump (his last reported contribution was made in 2009).